I bet you have always wanted to make Long John Silvers fish recipe, now you can with this copycat recipe. You can recreate this crispy fish batter at home. Do you love this crispy batter-dipped fish? Crispy on the outside, with the fish cooked perfectly on the inside, it is hard to resist this fish. Growing up this was a favorite restaurant of mine. I remember the day when the Long John Silver’s first opened in Pueblo, Colorado. My family got in the car, and we were soon munching on this fish. This batter is very close to the Fish and Chips that are served overseas. What makes this recipe unique, is that the fish is crispy, but it isn’t done with a beer batter. Club soda is the key ingredient that makes this batter extra special. The batter has both baking soda and baking powder in it, and when combined with the club soda, it gives the batter a special lift you will love. When you make this recipe at home, you can use any fish that you like. 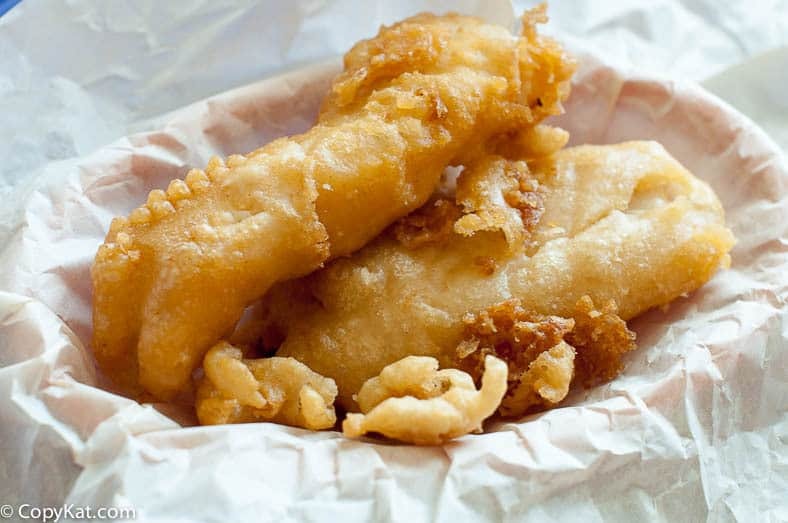 Long John Silver’s uses Wild-caught Alaskan Cod. I have made my recipe with cod I purchased at Costco. I think this would work well with catfish or even tilapia, or any other white fish you may have. You may even want to check out my Long John Silvers Chicken Plank recipe. I do have some tips on technique. 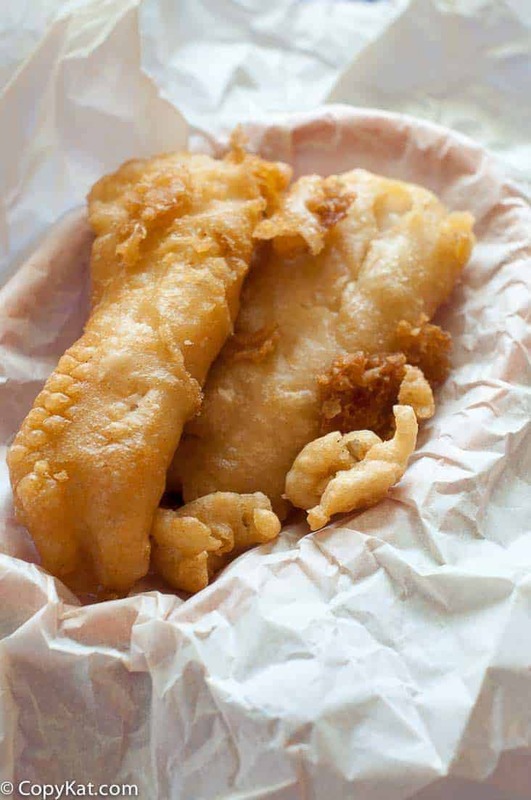 Make sure your fish pieces are no more than 3 ounces when the fish is heavier it will immediately sink in the oil, and the batter may wrap itself around the heating elements of your fryer. If you are simply using a pot to heat your oil in, this may not be an issue. I like to raise and lower the battered fish pieces a few times when I lower them into the oil, this way the batter can cook just a little, and the expansion of the batter is less troublesome. It isn’t difficult to do at all, but this batter does expand while cooking, it is one of the characteristics that make this batter so unique. I hope you enjoy one of my childhood favorites. You could use this same batter to dip chicken tenders, shrimp, and even onion rings. You may want to serve this recipe with some tartar sauce. If you are not using a fryer, heat up 8 cups of vegetable oil in a heavy pot until the temperature reaches 350 degrees. Make the batter by combining flour, corn starch, sugar, salt, baking powder, baking soda, onion salt, paprika, ground black pepper. Stir to combine all dry ingredients. Add club soda to dry ingredients. The batter will foam, continue to stir.Drop pieces of fish into the batter. Coat fish with batter, drop into hot oil. Fry fish for 2 to 3 minutes or until the batter is golden and the fish pieces begin to float to the top of the oil. Drain fish on a wire rack. To keep the batter from sticking to the bottom of the basket, gently lower fish and hold it for a few seconds to allow it to form up a crust before dropping it into the basket. You can swap the club soda for beer for a great flavor. Have a little batter leftover? Slice up some onion rings, and make onion rings. Have you tried this with shrimp? I wonder if you’d be able to taste the shrimp. The batter is a thicker batter & I’m thinking it’ll overpower the shrimp? What would I have to do to cook this in an air fryer? Thanks! You would have to change the batter. This wet of a batter is likely to slide off before the fish gets cooked. You could batter fish with Panko bread crumbs, but that is a different batter. Five stars from our house! If you use water, I don’t think the batter will perform quite the same way, it should work, but the results will be different though using a beverage that is carbonated.